A fun collection of golf quips and anecdotes. For all golf addicts from the duffer to the pro - this little book is packed with the best jokes, comical illustrations and funniest quotations. Personalise the cover of this A Round of Golf Jokes Gift book with a name of up to 12 characters. Inside the cover add a message of up to 5 lines of 15 characters. personalisation needs to be entered exactly how you require. A Helen Exley Gift book. The words 'A Round of Golf Jokes For' are fixed and cannot be changed. 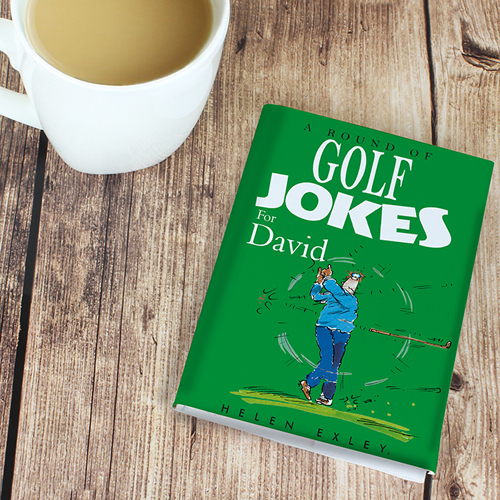 Personalise the cover of this A Round of Golf Jokes Gift book with a name of up to 12 characters.